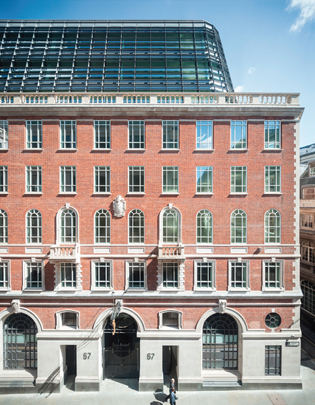 67 Lombard is a 90,000 sq ft speculative office development situated in the City of London’s oldest street and historic home to the British banking sector. The redevelopment has rejuvenated a classic City building, combining a traditional 1930’s red brick façade with an ultra-modern glass and steel extension. Behind this envelope chic and sophisticated office space has been created for an occupier that demands high specification to meet their business needs, but who also seeks discretion in how they are portrayed. The building was launched to the market in October, 2014.